We're always chatting with our customers about their requirements and how to best deliver solutions that address them. We've been busy this past year, building devices that make customer workflows simpler and faster. CRU introduced the Data Express DX175 for short 5.25" drive bays (like those found in HP's new Z series workstations), the DataPort DP27 for optical bays, and the Data Express QX310 for PCIe/NVMe SSDs. 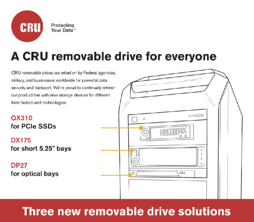 Take a quick tour of our three new removable drives with the infographic below!